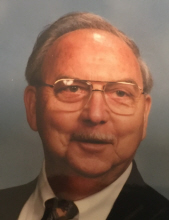 William "Bud" Bryan Whisnant, 92 formerly of Lawndale passed away, Friday, April 5, 2019 at Shelby Manor. Born January 30, 1927 in Cleveland County, he was a son of the late Durham Plato Whisnant and Sue Grigg Whisnant. Bud graduated from Piedmont School, Lawndale and Gardner Webb College. He would then join the Marine Corp during World War II and this would allow him to attend the Citadel. He would retire from Carolina Freight Carriers. After his retirement Bud went on to get a degree in agriculture which allowed him to work as a meet inspector for the State of North Carolina. Though the job that brought him the most joy was driving a school bus and a Christian Tours tour bus in his retirement years. In addition to his parents, he was preceded in death by his wife, Marilyn Hicks Whisnant; daughter, Gloria Lynn Cassady; and brother, Carroll Whisnant. He is survived by his son, Bryan Hicks Whisnant of Atlanta, GA; daughter, Robin Whisnant-Heath of Shelby; sister, Meryle W. Anthony of Lincolnton; granddaughter, Lindy Paxton Burgess; and great-granddaughter, Emma Grace Burgess. A graveside service will be Monday at 3:00 PM at Rose Hill Memorial Park Mausoleum, Fallston officiated by Dr. John Ware. To send flowers or a remembrance gift to the family of William "Bud" Bryan Whisnant, please visit our Tribute Store. "Email Address" would like to share the life celebration of William "Bud" Bryan Whisnant. Click on the "link" to go to share a favorite memory or leave a condolence message for the family.